Personal Capital is an online investment portal that offers you the benefits of a roboadvisor alongside human advice. Similarly, Vanguard Personal Advisor Services combines computer-generated algorithms and financial experts to help you invest your money. Both online services are geared toward users who have a significant amount of capital to invest. We checked out the fine print to compare Personal Capital vs Vanguard and see where they differ to help you figure out which is a better fit for you. Which Service Offers Higher Selection Of Accounts? Who Wins On Lowering Your Tax Bill? With approximately $120 billion in client capital under management, Vanguard is a tour de force in the online investment space. It is among the largest online investment management firms with 20 million investors, and it has leveraged its size to keep management fees lower than many of its competitors. Its entry-level investment fee is just 0.3% of the assets you place under management. The more you invest with Vanguard, the lower the fee, which goes as low as .05% if your balance tops $25 million. If your account balance is $500,000 or more, a dedicated advisor is assigned to you for a nominal fee. Once you have entered your financial data, investment goals, and risk tolerance, the Vanguard’s robo-advisor builds a portfolio of Vanguard funds. You also get an initial consultation with a human financial advisor via email, phone, or video conference. The ongoing advisor service is optional. It is possible to elect the robo-advisor and skip the human advice. Clients with balances under $500,000 can also purchase help from one of approximately 100 advisors. Personal Capital can’t compare with Vanguard’s low management fees. At 0.89% annually for up to $1 million invested, its entry-level charge is nearly three times as much. Nevertheless, it does offer discounts on higher balances. Still, don’t expect a rock bottom deal from Personal Capital. Even with its top discounted rate of 0.49% for investment accounts over $10 million, the fee is still higher than Vanguard’s initial 0.3%. 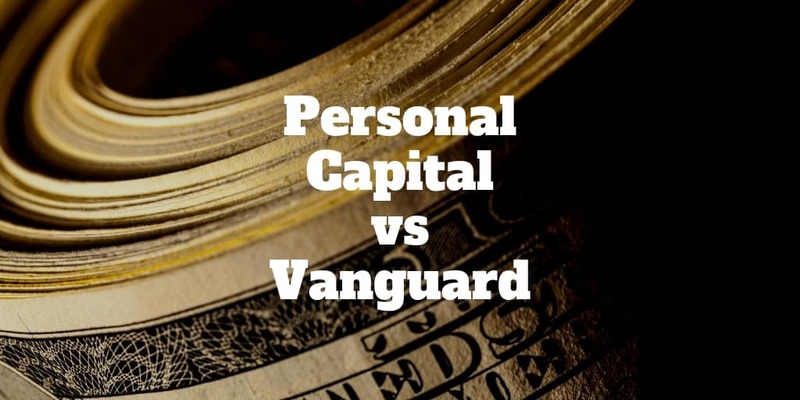 With approximately 18,000 investors under the Personal Capital umbrella compared to 20 million at Vanguard, and $8 billion under management compared to the $120 billion Vanguard manages, Personal Capital is the David to Vanguard’s Goliath. However, the lineup of services it offers may tip the scales in its favor. For example, if you have invested over $200,000, you can add individual stocks and ETFs to your portfolio. If your balance is over $1 million, you can add specific bonds. Personal Capital also offers a socially responsible portfolio for those who are committed to supporting environmental, governance, and social practices that mesh with their personal convictions. >> What Is A Socially Responsible Portfolio? The variety of investment tools you can access depends on the amount you have invested. You can get the investment checkup tool, the 401(k) analyzer, and the spending tracker when you sign up, even with a zero balance. The scalable list of tools grows as your investment capital increases. Retirement planning, private banking, and estate planning are available to top-level investors. And a live support team is available for account balances north of the minimum $100,000. Plus, dedicated support is offered from a duo of advisors once you invest more than $200,000. Interactions take place on the phone, by email, or via video chat. Fees are one of the biggest differentiators between these two online investment sites, we took a closer look at how they stack up, side by side. Vanguard bases its annual management fee on your investment amount. If your total is under $5 million, you pay 0.30%. If it is between $5 and $10 million, the fee is 0.2%. For balances of $10 to $25 million, the annual fee is 0.1%, and if your balance is more than that, your fee is 0.05%. Personal Capital’s mobile app will sync with traditional checking and savings accounts, credit cards, home mortgages, home equity loans, IRAs, and trusts. The investment management service caters to standard taxable accounts, as well as retirement accounts, and will even advise you on your 401(k) and 529 plans but does not directly manage these for you. Vanguard Personal Advisor Services supports individual and joint accounts, IRAs, trusts, and college savings 529 accounts. The Personal Capital tax strategy includes tax-loss harvesting for portfolios with a mix of stocks and ETFs. You can also discuss tax issues with your human financial advisors. Vanguard Personal Advisor Services provides you with automatic allocation of your investment capital between taxable and tax-adjusted securities. It also customizes its tax harvesting function on an individual basis to optimize your specific tax savings. Comparing Personal Capital vs Vanguard on taxes is a tie. Personal Capital relies on a hybrid model that combines digital and human input. This online service has folded the greater cost of expert consultation into its annual fees and has built a scalable model according to how much you invest. At the basic level of $100,000, you get access to a pool of investment advisors. If you invest more than $200,000, you are entitled to a dedicated pair of investment experts who know your specific data, investment strategy, and financial goals. Vanguard Personal Advisor Services offers initial access to its team of financial experts when you first open your account. The threshold is higher to be assigned to a dedicated advisor at Vanguard, you’ll need $500,000. However, you’ll pay a maximum of 0.3% per annum for this personal touch. Once your account balance exceeds $1 million, your dedicated human advisor is free of charge. You could even plan your retirement or your child’s college fund with the tools provided. The Vanguard website includes an investment calculator, a tool to compare investment growth, and a comparison widget for mutual fund and ETF costs. The minimum Personal Capital account includes Smart Weighting, which balances your portfolio by weighting your funds and individual securities based on algorithms, financial strategy planners, and college savings planning tools. At the private client level for accounts exceeding $1 million, you also have tax, estate, and legacy portfolio options. An extensive library of articles on an array of finance-related topics is available to all account holders. Vanguard and Personal Capital both offer access to human financial advisors. Both provide customer support by phone or email. Personal Capital’s website has a support portal where you can find how-to guides and answers to many common questions about site security and technical issues. Vanguard has a similar self-help page. Both investment portals offer fully functional mobile apps at no cost to account holders. You can sync your app with your primary account for easy access to your data. The free apps for Apple or Android from Personal Capital are designed for smartphone, tablet, and/or desktop use. The app works on your Apple Watch, too, so you can track your spending in real time with a flick of your wrist. You can set limits on your monthly spending, receive alerts when your net worth rises, and compare your investments with major indices such as Dow Jones and Nasdaq. Vanguard’s free mobile apps for Apple or Android devices allow you to manage and track your accounts from anywhere you go but doesn’t match the world class user interface and experience offered by Personal Capital. The app for Apple devices features your choice of touch or face ID for quicker activation. On the app, you can transact trades, conduct research, and access real-time market data. If you have half a million bucks or more, Vanguard edges out Personal Capital by virtue of its lower annual management fee as well as its lower minimum balance of $50,000. It provides you with an initial live consultation during the portfolio planning stage and a dedicated advisor once your balance is above $500,000. Remember that you will pay a nominal fee for that service. Vanguard does not charge you an annual account fee while Personal Capital does. Finally, Vanguard is a far larger firm than Personal Capital, and it has a much longer client list and more money under management. However, if you have $100,000 to invest, Personal Capital is the better choice because you will be connected to financial experts and be assigned two dedicated advisors if you invest $200,000. Plus you’ll have access to a world class budgeting app free of charge. The bottom line is if you want to save on fees, go with Vanguard. If you want a service that includes free human advisors who are familiar with your account, Personal Capital is likely a better fit for you. Both sites are geared toward affluent investors looking for concierge-type financial services with personalized attention and a human touch.